As we head rapidly toward the 2018 holidays, our thoughts may turn to which wines to drink at this year's Thanksgiving table. Yes the time-tested candidates (Beaujolais, Condrieu, California whites) will still serve you well, but we also feel that one of our favorite regions, the Savoie, should not be overlooked. Both whites and reds from this mountainous wine region can pair perfectly with not just the turkey but all the sides (think Arbin Mondeuse with cranberry sauce or even instead of the cranberry sauce) and even the iconic pumpkin pie (think a floral, honeyed Roussette de Savoie). With this in mind we turn to one of our original Savoie producers, Le Cellier du Palais, in the cru of Apremont. This delightful cru village lies on the western side of la Cluse de Chambéry facing Chignin, at the base of Mont Granier. It has its vines planted on slightly higher soil with primary glacial deposits blended with limestone rubble. This is perhaps why it often exhibits a mineraled character, with a flinty nuance weaving its way through the fruit. The name of the domaine comes not only from the name of its location (called Le Palais) but also from the play on words with how we taste wine, the palate (palais in French). 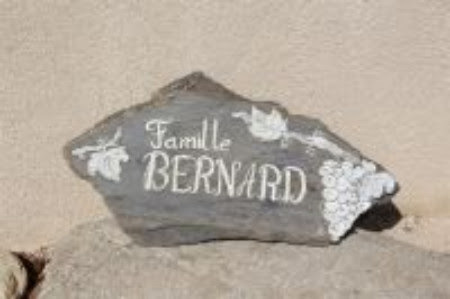 The property surrounding the domaine has been in the Bernard family since 1700, though bottling at started two generations ago. 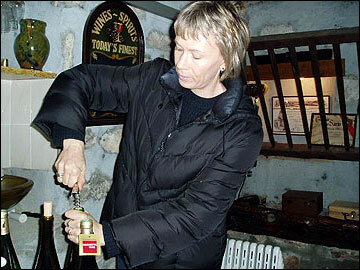 René Bernard took over for his father in 1974, and his daughter, Béatrice, has since taken over the vinification. Their small vineyard is scattered over just 7 hectares. Some of these have a subsoil very rich in chalk, others have soils of decomposed glacial deposits. There the Bernards have 3 grape varieties planted: Jacquère, Altesse and Chardonnay (believe it or not, the Chardonnay grape became widely planted in the Savoie during the 1960s, although not much of it remains there). Béatrice works her vines according to the practices of lutte raisonée, keeping treatments to the absolute minimum while organically working the soil to promote healthy support for the vines. Some leaf plucking and green harvesting helps to maximize the concentration of the remaining grapes. The harvest is done by hand by a small team of workers. A gentle pressing is followed by a cold fermentation in an effort to guard the maximum aromas of the grapes. Afterwards the wine stays sur lie for between 4 and 10 months, depending on the cuvée. The wines do not undergo malolactic fermentation, so that they retain their bright, refreshing acidity. ​The Le Cellier du Palais Apremont Vielles Vignes 2016 is 100% Jacquere from the Bernard family's vines with an average age of 80 years. It is vinified in stainless steel and then aged sur lie in the same stainless steel for 4-6 months. Its aromas of white flowers and peach pit are followed by flavors of mango, yellow peach and apricot, and a pleasantly round and long finish. All of these flavors make it an ideal beverage for your undoubtedly delicious Thanksgiving dinner.